GREENSBORO –The dark chocolate worked. So did the lucky key chains and the cold shower. Laura Zeng probably doesn’t need all those good luck rituals. Her talents in rhythmic gymnastics were enough for her to earn her fourth-straight gold medal at the USA Gymnastics Championships Saturday. In doing so, she became the first American women to win four straight rhythmic senior all-around titles since Sue Soffe won six from 1976 to 1981. She’ll stick with her rituals and superstitions for one simple reason – she’s not taking any chances. 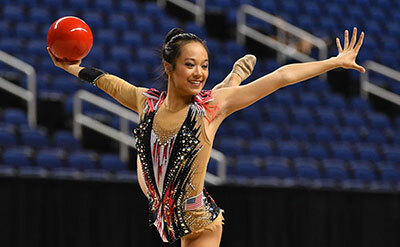 Following a solid performance in the preliminary round, Zeng earned a score of 138.319 in the finals for the gold. Evita Griskenas, also of North Shore, placed second with 135.386, with their teammate Camilla Feeley third at 133.537. The national championship is an important step on Zeng’s path back to the Olympics. In 2016, she was good enough to place 11th in Rio, and it’s that 11th-place finish that is driving her and insuring she takes no chances. Competing in the Olympics was not on her mind when she took up the sport as an eight-year-old. Zeng found the multiple elements involved in rhythmic gymnastics to be interesting and challenging. Zeng has a special relationship with the tools of her trade — her ribbon, ball, clubs and hoop. When asked which is her favorite, she wouldn’t say. Again, why take chances? Tokyo is important to Zeng, an 18-year-old resident of Libertyville, Ill., so important, in fact, she has put off attending college. usagymchamps.com is a USA Gymnastics production. To learn more about USA Gymnastics, visit usagym.org.